No End. An installation by Yuriko Yamaguchi from WTA – Werner Thöni Artspace on Vimeo. Even though many of the dealers in the Chelsea art zone have booths at the large fairs, they keep their gallery doors open for sidewalk strollers and all those out-of-town collectors. The walkable High Line and the new Whitney Museum of American Art energize the south end of this westside neighborhood. Yuriko Yamaguchi, “Bliss in Holy Warrior,” 2014. (©Yuriko Yamaguchi, courtesy the artist) Yamaguchi is represented by Chelsea’s Howard Scott Gallery, where her current one-person show, “Interconnected in Art, Nature, Science and Technology,” is on view Feb. 18–March 26, 2016. Yuriko Yamaguchi was born in Osaka Japan but has lived and worked in the United States since the early 1970s. Her work has been exhibited internationally and has been collected by the Hirshhorn Museum and Sculpture Garden, the National Museum of Women in the Arts and the National Museum of American Art. She is also on faculty of the Studio Art program at George Washington University. This is her second solo exhibition at Adamson Gallery. 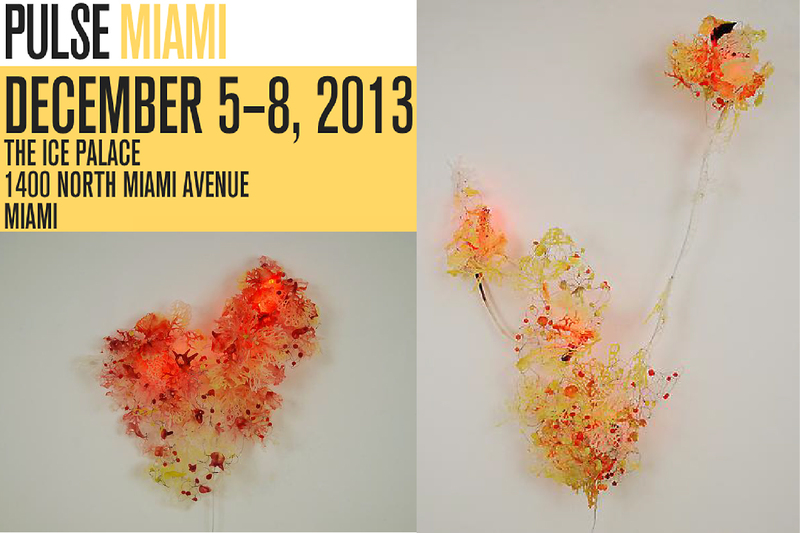 For more information, please contact the gallery at (202) 232 0707 or info@adamsongallery.com. Washington Art Matters: 1940s–1980stells the story of art made here during five crucial decades. As such, this is the first major effort by a museum to present a comprehensive history, representing those times with works by some 80 artists. The exhibition is based on Washington Art Matters: Art Life in the Capital 1940-1990, a book published by the Washington Artists Museum and co-authored by Jean Lawlor Cohen, Benjamin Forgey, Sidney Lawrence and Elizabeth Tebow. 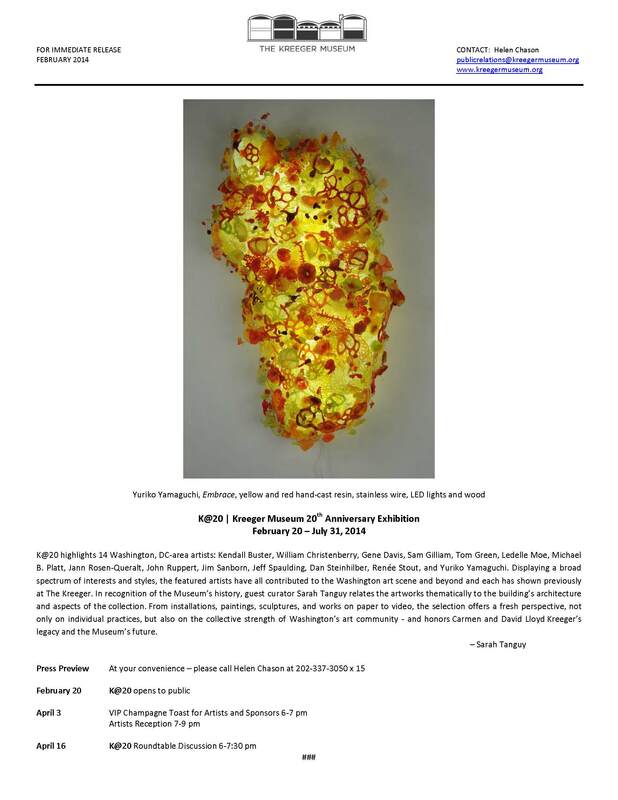 The DC Commission on the Arts and Humanities is pleased to announce the opening of an exhibition of fine art to celebrate the commencement of the National Cherry Blossom Festival. 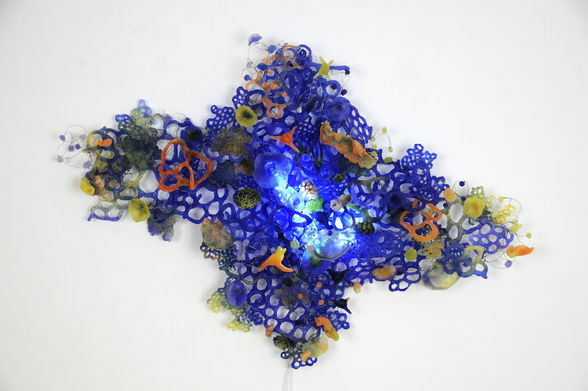 This special exhibition, which opens on Friday March 22nd at the DCCAH Gallery at 200 I (Eye) Street, SE, will bring together the works of Japanese-born sculptor Yuriko Yamaguchi, painter Michi Fugita, and internationally renowned multimedia artist iona rozeal brown to form an other-worldly landscape in bloom. 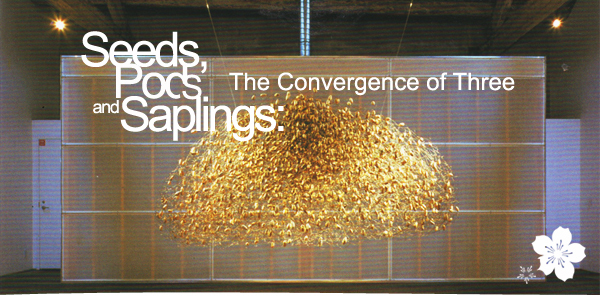 Curated by Zoma Wallace, the exhibit runs March 22-June 30, 2013 with round-the-clock access to the building’s gallery. For more information, contact Zoma Wallace, or call 202-724-5613. The D.C. Commission on the Arts and Humanities is preparing a new exhibition for the 200 I Street Gallery to celebrate the National Cherry Blossom Festival. 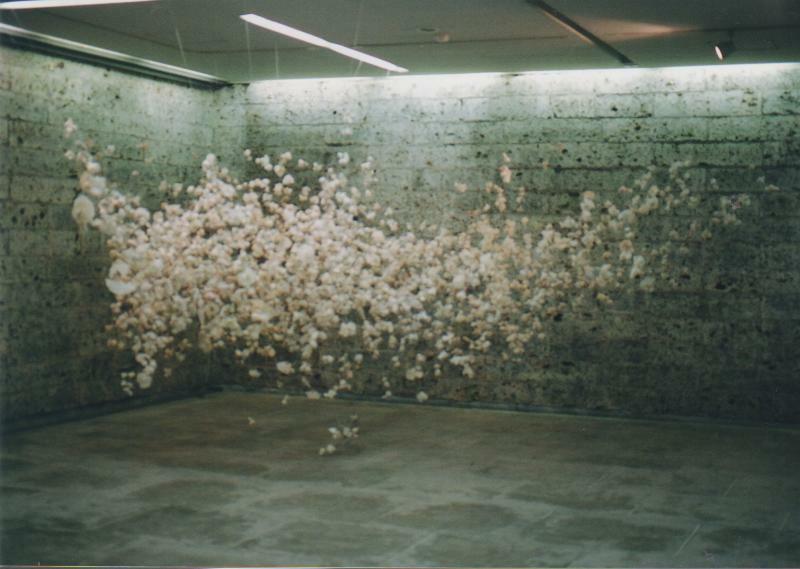 As part of the upcoming exhibition, Japanese artist Yuriko Yamaguchi will create a special blossom-like sculpture made up of the hand-written wishes and prayers of every person that visits 200 I Street, SE. This sculpture will hang in the gallery from March 22nd to June 30th. During the exhibition, visit the work write a prayer or wish for yourself, your family/friends, or for humanity. You can create as many filter prayers/wishes as they like. On Monday, March 18th, Yamaguchi will sit in the Gallery to create a suspended sculpture made of thousands of your hand-written prayers/wishes. This sculpture will represent our collective hopes, dreams, wishes and prayers. As a community, we hope that we all can share in the creation of a unique sculpture made to bring us together in art. Concept: We explore our interconnected world in this workshop through making sculptures and installation art. We investigate avenues of connectivity between art, science, history and society as a whole. Flexibility and holistic concepts are nurtured in learning contemporary methods of mold making and casting resin. “The Web of Life” by Fritjof Capra is our reference book for core concepts, as we produce at least two projects over the course of this week. Media & Techniques: Skin wax, hydrogel and plaster as mold making materials. Silicone, Aqua, nontoxic resin and polyurethane rubber as casting mediums. Activities: Demonstrations of rubber mold making, experiments, brainstorming and the execution of ideas. Faculty: Yuriko Yamaguchi’s works are in numerous museum collections, including the Museum of Modern Art in Kanagawa, Japan, the Hirshhorn Museum and Sculpture Garden, and the Corcoran Gallery of Art. She has received various awards, including the American Academy of Arts and Letters award, a Joan Mitchell Foundation award and fellowships from the NEA and the Rockefeller Foundation Bellagio Center. Yuriko Yamaguchi (born 1948) is a Japanese-American sculptor. Yuriko was born in Osaka, Japan. She attended the University of California, Berkeley, graduating in 1975 with a BA. She went on to undertake directed study at Princeton University, and completed a Master of Fine Arts at University of Maryland, College Park in 1979. She is currently a professor at George Washington University. Works by Yuriko are found in a number of museum collections including: Hirshhorn Museum and Sculpture Garden, Smithsonian Institution, Washington, D.C. Philip Morris Art Collection, New York, N.Y. National Museum of Women in the Arts, Washington, D.C. Smith College Museum of Art, Northampton, MA National Museum of American Art, Washington, DC.